sample image 2CV old, radiator grill, Citroen emblem from aluminum casting. Suitable for Citroen 2CV to year of construction 1955. (Corrugated sheet bonnet). The emblem must be adapted something. sample image 2CV, Luggage compartment lid, emblem (signature) "2CV", from synthetic chromium-plates. Length about 55mm, height of ca.21mm. sample image 2CV, Luggage compartment hood. Emblem "2CV Special" made of metal. Reproduction like original, 35x212mm. sample image 2CV, Luggage compartment hood. Emblem "2CV" swung, from 3mm high-grade steel. Made in Germany by Franzose. The signature 16836 consists of: 1x "2" + 1x "CV". The emblems are fastened with 4x M3 nuts (our article number 20166). sample image 2CV, Luggage compartment hood. Emblem "CITROEN" swung, from 3mm high-grade steel. Made in Germany by Franzose. The signature is about 180mm long, and 65mm highly. The emblems are fastened with 2x M3 nuts (our article number 20166). sample image 2CV, Luggage compartment hood. 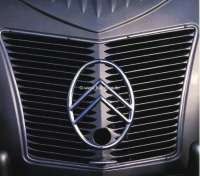 Emblem CITROEN made of metal. Reproduction like original, 35x160mm. Also fitting for other Citroen! sample image Signature label "C I T R O E N" for the chrome hinge strip of the luggage compartment lid (long signature). Suitable for Citroen 2CV. sample image Signature label "C I T R O E N" for the chrome hinge strip of the luggage compartment lid (short signature). Suitable for Citroen 2CV. sample image Label "AKS". Suitable for Citroen AKS (2CV van). sample image Label "operating instruction" Mehari 4X4, transparent version. sample image Label "Citroen prefere total" for the back window. Suitable for Citroen DS + 2CV. Dimension: 85 x 110mm. sample image Sticker "Citroen Total", in the rear window. For Citroen 2CV, CX, DS, GS. The label is stuck from the inside! Measurements: 32x250mm.